ESA Theatre will stage the famous comedy "A Story about the Botanist-Doctor Monsieur Jordan and the Famous Sorcerer Dervish Mastali Shah" by Mirza Fatali Akhundov . The performance will take place in Azerbaijan State Academic Opera and Ballet Theater on July 7, Trend Life reported. The production is timed to the 100th anniversary of the Azerbaijani Democratic Republic and implemented with the assistance of the Azerbaijani Youth Foundation. 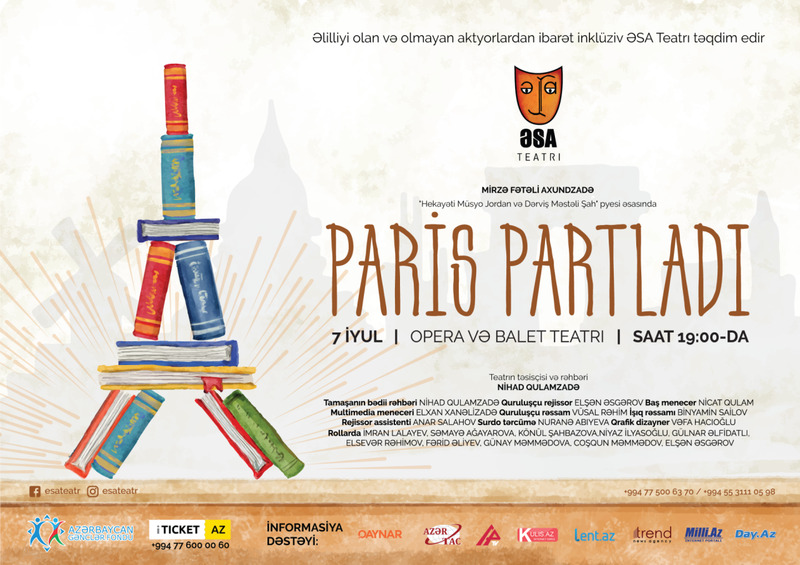 The production director is Elshan Askerov, main producer is Nijat Gulam, multi-media manager is Elhan Khalalizade, art director is Vusal Rahim, light artist is Binyamin Sailov, graphic designer is Vafa Gadzhioglu, sign language interpreter is Nurana Abiyeva. Tickets can be purchased at all ticket offices of the city, ASAN Service Centers, Ganjlik Mall, 28 Mall as well as website www.iticket.az. Ticket price is 3-30 AZN ($ 1-17). For those who want to support the team can buy special tickets for 500 AZN ($293). ESA Theatre founded on September 3, 2016 is the first inclusive theatre consisting of actors with disabilities of the country and the Caucuses. The progressive goals such as to ensure and accelerate social integration of the persons with disabilities, to ensure joint activity of the person with or without disabilities, to raise their social and public welfare, to promote them to deal with not only theatre, but also other fields of the art and etc. have caused establishment of ESA theatre. Despite the fact that the theater began its activities in the short time, the theater performed with several successful performances and gained a record number of spectators. A Story about the Botanist-Doctor Monsieur Jordan and the Famaus Sorcerer Dervish Mastali Shah is a satirical comedy created by the great Azerbaijani playwright and poet M.F. Akhundov. The comedy was written on the basis of real facts. In 1840'ies the French scientist Aleksis Jordan came to explore the Karabakh flora. He was very pleased with the humanist and hospitable attitude of Azerbaijani people towards him. When he left Azerbaijan he said that he would always remember Karabakh and Azerbaijani people who did their best and served him sincerely. In the image of Monsieur Jordan M.F.Akhundzadeh describes him as a progressive scientist-the representative of the developed French bourgeois society contradicting dervish Mastali Shah who deceives the illiterate people.